You asked us for a challenge and we have got one for you! This is a triathlon with a difference in the beautiful setting of the Lake District. During this day challenge you will cycle 23 miles, trek 6 miles and canoe on Derwentwater for 1-2 miles. It is challenging and exhilarating! This is a BDFA only event so everyone taking part will be fundraising for the BDFA and our vital work. Join us on our marathon walk around our capital city, taking in world-famous sights and less well-known corners as we trace a 26-mile route through London. Cycle 100 miles on closed roads through London and the Surrey countryside finishing in central London on the Mall. Registration is now closed for this event, good luck everyone! Superhero in the City is London’s iconic 5k Superhero Run, all runners get a cape and mask and it is open to all Superhero’s over the age of 8. Starting on the Millennium Bridge, you will begin by running over the Thames and enjoying the world famous view of Tower Bridge. The the route then takes you along the historic south embankment, past Shakespeare’s Globe Theatre and some of London’s oldest pubs, and the Borough Market area. You’ll cross over Southwark Bridge and hug the north embankment running towards the Tower of London and then return through the City, back towards St Paul’s Cathedral, via Millennium Bridge. 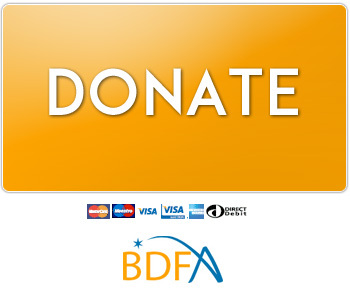 Contact our fundraising team at fundraising@bdfa-.org.uk for more info. Santa in the City is London’s iconic 5k Santa Run (santa suit included in the registration fee). This festive 5k Santa Run is the only event where you’ll run past some of the most iconic locations in the world, dressed as a santa! All Santas and Santas helpers must be 8 or over. The santa run starts on the Millennium Bridge and you will begin by running over the Thames and enjoying the world famous view of Tower Bridge. The santa dash route then takes you along the historic south embankment, past Shakespeare’s Globe Theatre and some of London’s oldest pubs, and the Borough Market area. You will cross over Southwark Bridge and hug the north embankment running towards the Tower of London. You will return through the City, back over Southwark Bridge and turn right towards St Paul’s Cathedral, over Millennium Bridge to the finish line. Make a splash to support the BDFA! Adrenaline seekers are invited to take part in the thrilling KM Dragon Boat Race being staged to support the BDFA. Team Captain’s should book their KM Dragon Boat at www.kmcharitychallenge.co.uk and then reclaim the funds from crew members. We recommend you simply divide up the registration fee between the crew members, but don’t forget to ask your employers to m ake a contribution –they may even pay for the entire fee for your crew.